The Internet of Things (IoT) has exploded in digitizing business information and process in every industry. According to an IHS Technology whitepaper, IoT Platforms: Enabling the Internet of Things, IoT is expected to grow from 15.4 billion devices in 2015 to 30.7 billion devices in 2020 and 75.4 billion in 2025. Here at Motifworks we are seeing just that. 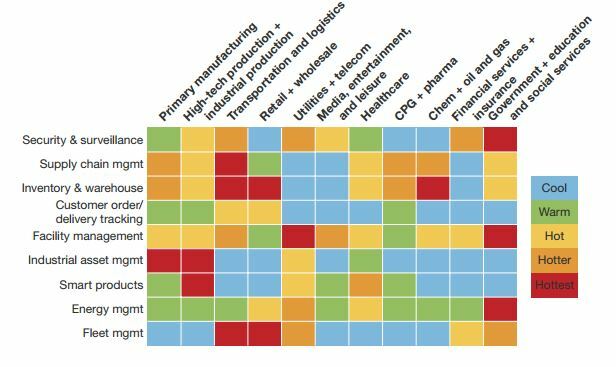 Interestingly, in 2016 Forrester, courtesy of Cloudera (reprint) issued an “Internet of Things Heat Map, 2016 Where IoT will Have the Biggest Impact On Digital Business”. Before we get to Motifworks’s take, let’s look at what the heatmap shows us. From an industrial and enterprise perspective production manufacturing, logistics and transportation have seen high application adoptions by customers. On the map, you can see which IoT applications will have the biggest impact on a certain industry. Industrial asset management in Primary manufacturing. Primary manufacturing firms must manage complex, industrial asset systems, and production processes. A manufacturing company deployed a senor-enabled system to connect, manage and remotely monitor materials, bath sampling, temperature and operational status of aluminum processing pots. It achieved 60% faster response time and operational efficiency, a 50% decrease in time needed to measure individual pot status and an 80% reduction in data capture errors. Smart products in High-tech production and industrial production. The connected factory is an idea that has been evolving for the past few years. Increasingly, it means expanding the power of the Web to link machines, sensors, computers, and humans in order to enable new levels of information monitoring, collection, processing, and analysis. Stanley Black & Decker has adapted the Internet of Things in a plant in Mexico to monitor the status of production lines in real time via mobile devices and Wi-Fi RFID tags. As a result, overall equipment effectiveness has increased by 24 percent, labor utilization by 10 percent, and throughput by 10 percent. Fleet management in transportation and logistics. Land ‘N’ Sea, a wholesale distributor or marine products, Dispatchers use GPS tracking to determine the location of every truck and can provide customers with up-to-date arrival times on their deliveries. GPS tracking identifies the most efficient delivery routes, and geofencing alerts the warehouse when a driver is five miles away to ensure that the driver’s manifest, invoices, and next delivery load are waiting. Land ‘N’ Sea achieved fuel savings of $14,000/month and overtime savings of $2,000/week. Inventory and warehouse in Retail and wholesale. Proactive retailers are implementing IoT solutions to improve the accuracy and efficiency of inventory management and supply chain processes. Lord and Taylor use RFID tags to identify an item and upload the inventory report data. This solution allows them to maintain inventory accuracy of 95%. Security and surveillance in government and education, and social services. City and local governments are deploying networked surveillance cameras and video analysis software to expand public safety capabilities. We recently held a webinar where we discussed Jump starting your IoT Journey with Azure IoT Hub, (Click here to watch the recording) What we said in that webinar is that to be successful, deploying IoT within a company takes a lot of planning. However, you should start with identifying areas within your business to have some early wins. Even though IoT can be a significant project, building an IoT proof-of-concept doesn’t have to take months or drain your IT resources. Whether your industry has a combination of attractive industry conditions and high adoption by customers or you simply want to gain immediate value from an IoT solution, Azure IoT Hub can help you jump start your IoT initiatives. Motifworks, with our IoT Accelerator, can deliver a working prototype in just 6 weeks. Learn More.